Palawan is one of the Philippines' last frontiers - still relatively undeveloped, it offers spectacular landscapes, world-class diving and a wildlife that has more in common with nearby Borneo than that of the other Philippine islands. Borneo and Palawan would have been connected by a land bridge during the last Ice Age. Busuanga is the largest island in the Calamian Group, covering some 900 square miles. The island is home to a game reserve and wildlife sanctuary, as well as being the pathway to some truly outstanding dive sites. Fishing, farming and cottage industries are the main activ¬ities of the islanders although the improvement of travel links to the island is now showing results and Busuanga is gradually receiving tourists. 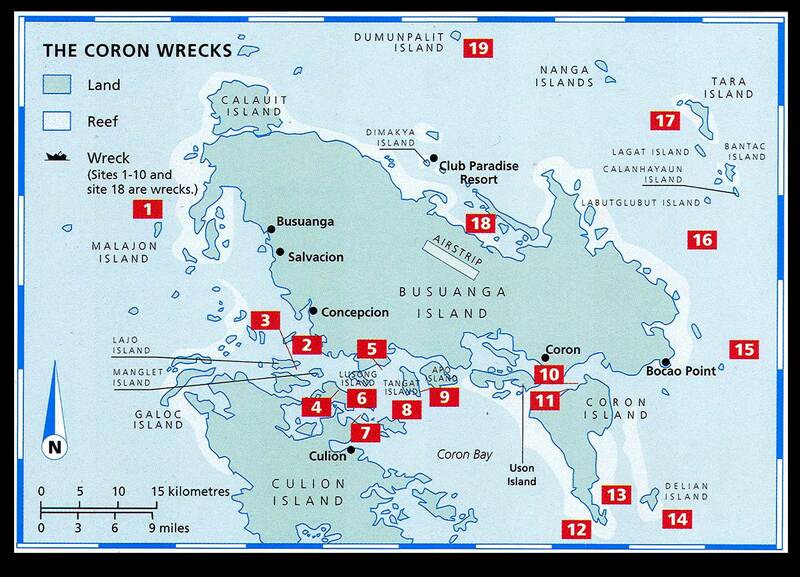 The World War II wrecks around Busuanga Island, particularly in Coron Bay, have been one of Philippine diving's best-kept secrets. 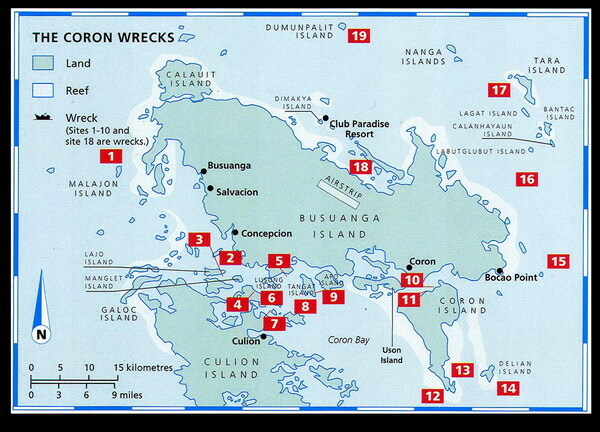 Here is a condensed version of Truk Lagoon in the Caroline Islands, Micronesia - a legendary (and, unfortunately, expensive) destination among divers for its large concentration of World War II Japanese wrecks. Admittedly the Coron sites are not easy to get to and accommodation is limited, but the area is rewarding to visit and prices are reasonable. The visibility is not brilliant, but the wrecks are not that deep and the currents not that strong, though it is always best to choose neap tides and, if possible, slack water. Twelve wrecks have so far been located in diveable depths, though those nearest to the Busuanga mainland suffer from poor visibility due to water runoff and plankton bloom. Most of the wrecks are long day trips from Coron Town, and some are best treated as an overnight trip, so you are not likely to dive here in really bad weather, though you can dive quite happily in heavy rain. The deeper wrecks have many fishing nets caught on them, so approach these with care. Early research on some of these vessels was done by wreck expert Brian Homan. More recently, in 1993-4, Peter Heimstaedt and Mike Rohringer from Germany did exten­sive research both on the wrecks themselves and in Japan, through the Military History Department of the Japanese National Institute for Defence Studies in Tokyo. Heimstaedt, a former officer in the Federal German Navy, is currently writing up this research. The scenery of Coron Island's limestone cliffs and tiny isolated beach coves is spectacular, as is that around its freshwater lakes. The diving is not confined exclusively to the wrecks, though these are the reason most divers would come here. Due mainly to typhoon damage, the coral is not that spectacular, but there is some perfect snorkelling to be had where it is good. Areas near to seven pearl farms, a fish farm and lobster farm are patrolled by armed security guards against illegal fishing. One of the freshwater lakes contains a hot spring and is only a short climb over limestone pinnacles from the sea. In it you find creatures of both salt and fresh water, plus a lone habituated barracuda nearly 1m (40in) long; as you go deep­er, the water gets hotter. There is also a delightful hidden cavern to explore, with an underwater entrance to the sea. The diving is best from October to May. All access details given in the following site descriptions are from Coron Town. In 1944 US Admiral'Bull' Halsey had the task of checking out the Japanese fire­power in preparation for the US landing on Leyte. To find safe passage for an air­craft carrier, he sent reconnaissance air­craft to photograph the Linapacan Strait and the Calamian group of islands. This resulted in a mapping officer noticing that some of the islands were moving about - a camouflaged Japanese fleet had been found. At 0900 hours on 24 September 1944 Task Force 45 carrier-based bombers attacked and sank 24 vessels around Busuanga and Coren Islands. Location: Between Lajo Island and Manglet Island, south of Concepcion village on Busuanga Island. One of the few true warships among the Coron wrecks (the others were mostly auxiliary vessels), the Akitsushima, sunk on 24 September 1944 by US aircraft, was a flying boat tender. The wreck (148m [487ft] long, 4650 gross tons) lies on its port side pointing 2900 (com­pass bearing) in 38m (125ft) of water, with the starboard side hullat 20m (65ft). The arm of the stern crane used to load and unload the flying boat lies broken to port in 34m (112ft). The main deck is split between this crane and the funnel. There is no sign of the flying boat. This is an advanced dive due to the depth, The ship can be penetrated with care, but is also good for fish life. Large groupers lurk in the hull and shoals of barracuda, tuna and snapper are found along it. The Akitsushima (秋津洲?) was a flying boat tender of the Imperial Japanese Navy, serving during the World War II. * In 1938, the IJN wanted to use their large-sized flying boats more effectively, because the only airplane which could hit the Pearl Harbor directly from Marshall Islands was the Kawanishi H6K. However, the Marshall Islands did not have flying boat facilities in those days. * Early 1939, the IJN converted the Kamoi to a flying boat tender. However, she was not able to repair the flying boats, she was only a pier for the flying boat. The IJN longed for a mobile maintenance ship for their flying boats. * The IJN thought about two kinds of flying boat tenders in basic plan of the Maru 4 Programme. One was a 10,000 tons class flying boat carrier, the other a 2,400 tons class flying boat tender. Those characteristics are below. * These plans were not able to pass the assessment by the Ministry of Finance. The IJN wanted a 3,500 tons class flying boat tender. This is basic plan of the Akitsushima. * The 3,500 tons flying boat tender was scaled-up model of the 2,400 tons class. Her duties were maintenance, repair and supplies to the flying boat in atoll. * The IJN intended to accommodate the flying boat by bow-up trim and slope at first, however this plan was canceled and Akitsushima equipped 35 tons crane. The IJN rewrote her drawings many times, and her displacement increased by 1000 tons in the detailed design. * 29 April 1942: Completed, and assigned to the 25th Air Division, 11th Air Fleet. * 15 May 1942: Sailed to Saipan and Rabaul. * 16 August 1942: Arrived at Shortland Islands for support to air/naval battles over and around Guadalcanal. * 1 September 1942: Bombed by B-17 at Buka Island. * 5 January 1943: Repairs were completed, and she was dispatched to Kavieng. * 26 February 1943: Arrived at Jaluit Atoll. * 30 June 1943: Sailed to Paramushir for exodus from Kiska. * 26 August 1943: Sailed to Yokosuka, Shanghai and Truk. * 17 February 1944: Slightly damaged by the Operation Hailstone. * 14 March 1944: Arrived at Yokosuka and repairs were started. * Spring 1944: Added the repair ship facilities, because the Akashi was sank. * 1 August 1944: Repairs were completed and she was assigned to the 2nd Fleet. * In August 1944: Sailed to Kure and Imari. * 8 September 1944: Sailed to Kaohsiung, Manila and Coron Bay. * 23 September 1944 : Arrived at Coron Bay. * 24 September 1944 : Sunk during an air raid by aircraft of Task Force 38. Sunk by aircraft at Coron Bay 24 September 1944. 29 April 1942:Completed at Kobe and assigned to 11th Air Fleet, 25th Air Flotilla. Equipping Officer Captain Mayazumi Haruo assumes command. Departed same day. 30 April 1942: Arrived at Yokosuka. 15 May 1942: Departed Yokosuka for Saipan. 19 May 1942: Arrived at Saipan; departed next day. 24 May 1942: Arrived at Rabaul. 25 May 1942: Assigned to Base Air Force, # 1 Special Duty Unit of 5th Air Attack Force of the 11th Air Fleet. June 1942: At Rabaul throughout. Bombed five times during this month but sustained no damage. July 1942: Same as above; on 17 July near-missed by bomb but no damage. 15 August 1942: Departed Rabaul for the Shortlands. 16 August 1942: Arrived at Shortlands. 29 August 1942: Departed Shortlands for Buka. 30 August 1942: Arrived at Buka; bombed three times with no damage. 1 September 1942: Bombed at Buka, "trifling" damage sustained, departed for Shortlands. For remainder of month, circulating between Buka, Shortlands, and Rabaul. Sustained bombing attack on five separate occasions but no further damage. October 1942: Same as above. Sustained four more air attacks, but no damage. November 1942: Remained attached to Base Air Force, 11th Air Fleet. Circulating between Rabaul and Kavieng. Under bombing twice, but no damage received. 3 December 1942: Captain Mayazumi relieved by Captain Takao Yoshimi. [Note: Given her departure the next day, it is possible that Captain Takao did not board the ship till arrival at Yokosuka.]. 4 December 1942: Departed Rabaul for Yokosuka. 12 December 1942: Arrived at Yokosuka. 23 December 1942: Entered drydock at Yokosuka. 30 December 1942: Undocked, assignment as before. 15 January 1943: Departed Yokosuka for Kavieng. 22 January 1943: Depart Kavieng, heretofore circulating between Kavieng, Mewe, Rabaul, Buka, and Shortland. 23 January 1943: At 1645 in position 15 miles southwest of Kavieng, escorting destroyer HAKAZE detects a submarine and charges, only to be torpedoed in the starboard side by USS GUARDFISH (SS-217), jacknife, and sink. Quick rescue work by AKITSUSHIMA saves DD CO LtCdr. Mashinori Kashima and most of the crew, but 13 are lost. 24 January 1943: Bombed at Rabaul; no damage. 26 January 1943: At Rabaul; bombed in harbor, no damage. 1 February 1943: Arrived at Shortland, remains there. Bombed three times during stay there, but no damage. 15 February 1943: Assigned to Base Air Force, # 1 Special Duty Unit of 2nd Air Attack Force. 21 February 1943: Depart Shortland. 24 February 1943: Arrives at Nauru; proceeds to Jaluit. 26 February 1943: Arrives at Jaluit; departs next day. 27 February 1943: Arrives at Ruotto. 28 February 1943: Depart Ruotto for Wake. 2 March 1943: Depart Wake, proceeding to Makin Island via Ruotto, Kwajalein, and Jaluit. 12 March 1943: Arrived at Makin; remains till end of month. 31 March 1943: Departs Makin; arrives next day at Imieji. 11 April 1943: Depart Imieji; arrives Makin next day. 26 April 1943: Depart Makin for Imieji; arrives next day; proceeds to Jaluit. 28 April 1943: Arrives at Jaluit. 3 May 1943: Depart Jaluit; arrives same day at Imieji. Remains there till end of month. 6 June 1943: Assigned to Eastern Force, # 1 Special Duty Unit of Air Force (under 11th Air Fleet). Departs Imieji for Shortland. 10 June 1943: Arrives at Shortland; departs and arrives at Rabaul next day. 12 June 1943: Depart Rabaul. 15 June 1943: Assignment changed to 2nd Base Air Force, # 4 Force of 21st Air Attack Force (under 11th Air Fleet). 16 June 1943: Arrives at Imieji. Stays till 18th. 25 June 1943: Return to Yokosuka. 30 June 1943: Depart Yokosuka. 2 July 1943: Off Hakodate today and the next. 6 July 1943: Arrives at Kashiwabara and remains till end of month. 19 July 1943: Air attack at Kashiwabara, no damage. 12 August 1943: Bombed at Kashiwabara, no damage. 26 August 1943: Captain Takao relieved by Captain Fujimaki Yashinori. 28 August 1943: Assigned to Northeastern Area Forces. 29 August 1943: Depart Kashiwabara for Yokosuka. 2 September 1943: Arrive at Yokosuka; attached to Combined Fleet (under 11th Air Fleet) the next day. 16 September 1943: Depart Yokosuka for Chinese coast. 20 September 1943: Arrive at Shanghai. 24 September 1943: Depart Shanghai for Truk. 2 October 1943: Arrive at Truk. 14 October 1943: Depart Truk for Yokosuka. 21 October 1943: Arrive at Yokosuka. 4 November 1943: Depart Yokosuka; arrive Yokohoma. 10 November 1943: Enter drydock at Yokohoma. 15 November 1943: Undocked from drydock; but has to re-enter on 20 November. 23 November 1943: Undocked from drydock for the second time. 27 November 1943: Return to Yokosuka. 3 December 1943: Depart Yokosuka for Truk. 9 December 1943: Arrive at Truk. Remains to the end of the year. January 1944: Remains at Truk throughout, same assignment to Combined Fleet forces. 6 February 1944: Assignment changed to Inner South Sea Area Force. 8 February 1944: Depart Truk, making runs to Ponape thru mid-month. 16 February 1944: Return to Truk. 17 February 1944: Air-raided at Truk by TF 58. 0620: Two 1,000 pound bombs dropped by planes from USS ENTERPRISE strike the ship; one forward of the bridge, the other on the very end of the fantail, damaging the plane crane. 18 February 1944: Still at Truk: Received third bomb hit amidships, which starts a large fire. Depart. 19 February 1944: Arrive at Mereyon from Truk. 22 February 1944: Depart Mereyon for Palau. 25 February 1944: Arrive at Palau. 4 March 1944: At Palau. Assignment changed to 14th Air Fleet under Combined Fleet. Depart for Saipan. 7 March 1944: Arrive at Saipan. 9 March 1944: Depart Saipan for homeland. 14 March 1944: Return to Yokosuka. 2 April 1944: Enter drydock at Yokosuka for temporary repairs. 7 May 1944: Attached to Central Pacific Area Force (14th Air Fleet). Depart Yokosuka for Kobe. 14 May 1944: Enter drydock at Kobe. June 1944: At Kobe all month. July 1944: At Kobe all month. 20 July 1944: Assignment changed to Striking Force, Combined Fleet. 2 August 1944: Arrive at Kure. Remains most of the month. 30 August 1944: Departs Kure for Sasebo; arrives next day. 5 September 1944: Depart Sasebo for Takao via Moji and Imari Bay. Assigned to Striking Force, First Diversion Striking Force. 8 September 1944: Depart Moji with convoy HI-75 screened by CVE SHINYO, DesDiv 30 YUZUKI and UZUKI, frigates KANJU, MIYAKE, and MANJU, convoying nine Marus. 13 September 1944: Arrive at Takao. 14 September 1944: HI-75 departs Takao for Singapore, AKITSUSHIMA still in company. 17 September 1944: AKITSUSHIMA and DesDiv 30 detaches from HI-75 accompanied by one Maru and heads for Manila. 18 September 1944: Approaching Manila, SAIGON MARU is torpedoed and sunk at 1044 in position 14-20'N, 120-50'E. She blew up and sank, and Akitsushima proceeded to Manila, followed by YUZUKI and UZUKI after they counter-attacked and conducted rescue attempts. 21 September 1944: Air-raid Manila by TF 38. No damage; ordered that afternoon to depart same day for Coron Bay. 22 September 1944: Arrived at Coron Bay from Manila and anchored in the narrow passage between Lajo Island and Manglet Island. 24 September 1944: Air-raided at Coron: attacked by more than thirty planes from U.S. TF 38, and suffered two direct bomb hits at 0905. One of these was a large bomb hit on the stern catapult track. This set off an enormous explosion, fueld by av-gas fires, that completely blew out the shell on the port quarter, and the stern was kept from breaking loose only by the keel and plates on the starboard side. Sunk: Capsized to port rapidly and at 0915 settled on her side to the bottom in position 11-59'N, 119-58'E. Despite the speed of the sinking, Minesweeper # 41 and naval transport T-102 rescued Captain Fujimaki, 25 officers, and most of the crew or they swam to shore, but 4 officers and 82 ratings were lost. (See Note 1). 27 September 1944: Survivors of Akitsushima including Captain Fujimaki landed at Manila by Minesweeper # 41 and transport T-102 and were accomodated by Special Base Force # 31.